JORDANIE - Lost for 2,000 years... Could this be the first portrait of Jesus? 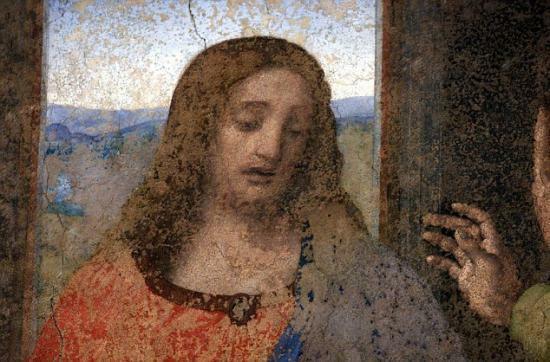 Lost for 2,000 years... Could this be the first portrait of Jesus? After 2,000 years buried within a cave in the Holy Land, the features are barely distinct as that of a human face. But Bible historians are trying to determine whether this is the first ever portrait of Jesus Christ. They are investigating whether the picture, which can still just about be seen to depict a man wearing a crown of thorns, was created in Jesus’s lifetime by those who knew him. 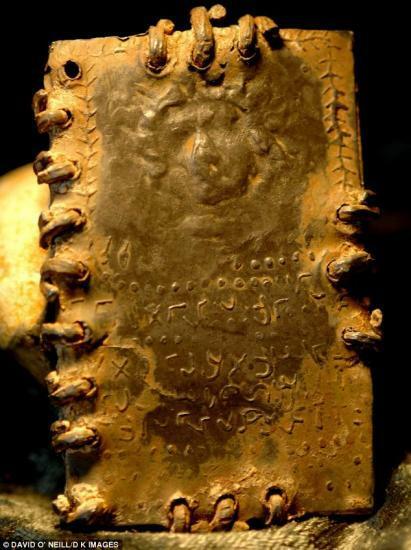 The portrait was found on a lead booklet, slightly smaller than a credit card, which lay undiscovered in a cave in a remote village in Jordan overlooking the Sea of Galilee. It was part of an astonishing hoard of 70 books found there, each with between five and 15 cast lead pages bound by lead rings. Historians believe the collection was made by followers of Jesus in the few decades immediately after his crucifixion. The most convincing evidence that the books are Christian is that one plate appears to show a map of the holy city of Jerusalem featuring crosses outside the city walls. And one phrase in the booklets appears to read ‘Saviour of Israel’ in ancient Hebrew. 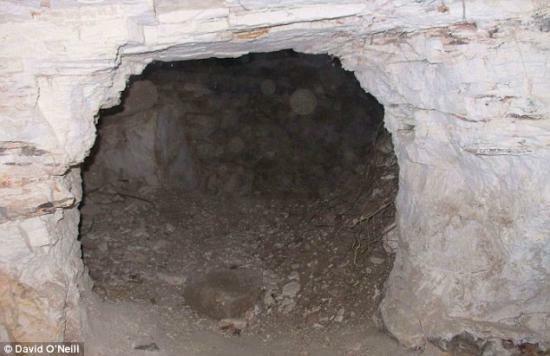 The discoveries were supposedly made between 2005 and 2007, when a flash flood exposed two nooks inside the cave, containing the booklets, metal plates and scrolls. 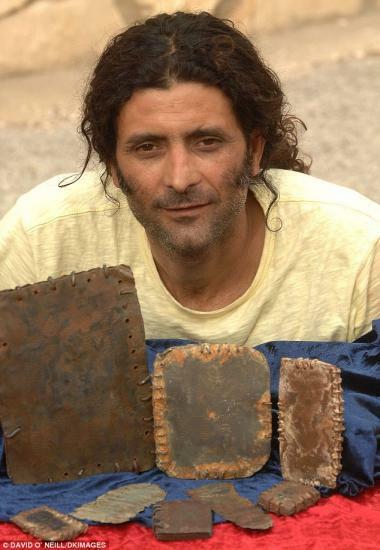 The director of Jordan’s Department of Antiquities, Ziad al-Saad, believes the booklets were made by Jesus’s followers shortly after his death. He said: ‘They will really match, and perhaps be more significant than the Dead Sea Scrolls. The booklets are currently in the hands of a Bedouin trucker called Hassan Saida who lives in the Arab village of Shibli-Umm Al-Ghanam in Israel. He has refused to sell them but two samples were sent to England and Switzerland for testing. 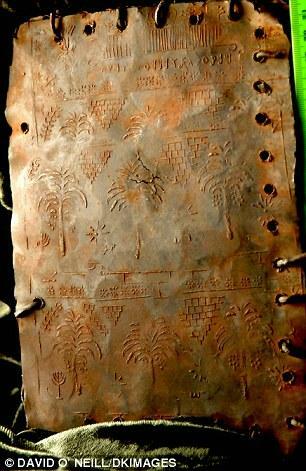 Mr Saida claims the books, containing cryptic messages in Hebrew and Ancient Greek, have been in his family since they were found by his greatgrandfather. He denies smuggling them out of Jordan. But there are claims that his Bedouin business partner bought the books from a villager in Jordan five years ago. The business partner is said to have taken the books over the border to Israel, where Mr Saida believed they had magical properties and that it was his fate to collect as many as he could. The Jordanian government said it would ‘exert all efforts at every level’ to return the artefacts to Jordan. David Elkington, a scholar of ancient religious archaeology who is leading a British team trying to get the books to a Jordanian museum, said they could be ‘the major discovery of Christian history’.